I had the pleasure to interview Dana K. from A Year Without Candy Blog. On February 28th 2010 she began the journey and promise not to eat candy for a year. Check out the interview below! I’m sure you’ll enjoy it! 1. You’ve mentioned in the past that you went two years without candy but failed due to someone offering you candy. I too find it most difficult when offered candy. YES BEING OFFERED CANDY WHEN YOU ARE TRYING TO QUIT IS THE TOUGHEST. YOU FEEL YOU SHOULD BE NICE AND SAY YES – AND THAT WAY YOU GET TO EAT CANDY, TOO! 2. What advice can you give, How do you say NO?? WHAT WORKS FOR ME IS TO SAY NO ALL THE TIME. SOME PEOPLE CAN BE MODERATE AND JUST HAVE CANDY ONCE OR TWICE A WEEK. I WISH I COULD BE LIKE THAT BUT I’M NOT. IF YOU’RE REALLY SERIOUS ABOUT GIVING UP CANDY FOREVER – OR JUST FOR A PERIOD OF TIME, JUST THINK OF YOURSELF AS HAVING AN ALLERGY TO CANDY THAT IS BAD FOR YOU SO YOU CAN’T EAT IT. 3. Which candies have tempted you those most during these first two weeks? BARS OF FRENCH CHOCOLATE ARE MOST TEMPTING, SINCE I LIVE IN FRANCE. I AM ALSO VERY TEMPTED BY ALL HOLIDAY CANDY – ESPECIALLY HALLOWEEN AND EASTER. 4. Which days of the week do you find it hard without candy? 5. Apart from losing weight during the lack of sugar intaKE, how does your overall body, soul and health feel without candy? I FEEL LIGHTER, AS IF I AM FREEING MY BODY, SOUL AND HEALTH FROM SOMETHING WHICH TASTES GOOD BUT IS BAD FOR ME. 6. What are you eating to replace sweets and candy? I’VE HAD HONEY AND PEANUT BUTTER ONCE SO FAR DURING 3 WEEKS OFF CANDY BUT I DO NOT WANT TO EAT A LOT OF HONEY. IT’S HARD BECAUSE WHAT CAN REPLACE SWEETS? 7. Do you consider eating sugar-free gum and candy during these 365 days or are they restricted as well? I’VE HAD SUGAR-FREE GUM ONCE BUT SUGAR-FREE CANDY NEVER AGREES WITH ME. SEEMS TO IRRITATE MY STOMACH. IN GENERAL I THINK IT’S BETTER TO AVOID SUGAR-FREE GUM OR CANDY IN CASE THEY REV UP CRAVINGS IN ME! 8. Most addictions are 99% mental correct? Does it cross your mind that you could fail or do you find strength from overcoming your candy addiction via the blog/readership? I DEFINITELY THINK I COULD FAIL ANY DAY BUT HAVING THE BLOG GIVES ME A LOT OF DISCIPLINE BECAUSE I DON’T WANT TO FAIL PUBLICLY! PLUS I WANT TO INSPIRE OTHER PEOPLE. 9. This question is more personal..For a person like me, I’m allergic to nuts and lots of fruit, what the heck could I eat besides sweets? 10. What is the meaning behind the pig in the pool? 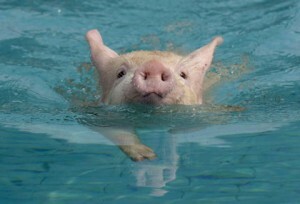 NO MEANING – SHE IS MY ALTER EGO, THE SWIMMING PIGLET – TRYING TO STAY ABOVE WATER WITHOUT CANDY! Thanks Dana for the interview! Many of my followers from the beginning know that I started by blog as well with hopes of eating candy only on Tuesday’s. Hence, the Candy Tuesday videos! It worked great but of course I have my bad days but I’ve slowed down quite a bit, also the braces help as well!! Anyway, if you feel your health or teeth or slowly rotting away why not promise yourself a break from candy every now and then! A year.. mmm… I think I’m controlling things fine! Like Dana, I’m more of an abstainer than a moderator; just can’t have it around at all!